How to decorate a fall mantel is the focus of today’s post. I take decorating a mantel very seriously. Okay, not really…it should be playful and fun! I’ve had quite a few lovely readers over the years tell me that their biggest dilemma is knowing how to start. First things first and in seasonal decorating you will most likely think about color first. My own rebellious independent spirit generally doesn’t necessarily sense color intrinsically with the season. Since the season’s bounty won’t be appearing for sometime in Florida, one thing that I do know as a designer and blogger is that I have to go faux. The real deal in pumpkins and gourds I’ll be able to incorporate into FALL TABLESCAPES later on and will decorate my fall mantels with faux. I’ve linked several of my seasonal AUTUMN MANTEL DECORATING posts before, and boy…do I ever have a bunch of them! With two fireplace mantels I’ve done so many styles and here’s a brief rundown of the process. 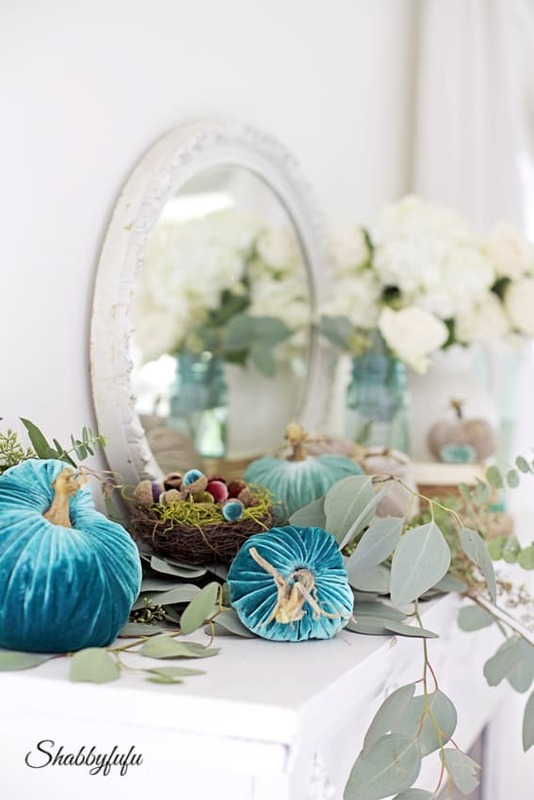 I won’t just limit my tips today to faux pumpkins and for the last several years we’ve all seen the heirloom pumpkins pop up in our markets in a variety of colors including some deliciously faded pastels! Will you go the PASTEL SEASONAL HARVEST route or bolder? 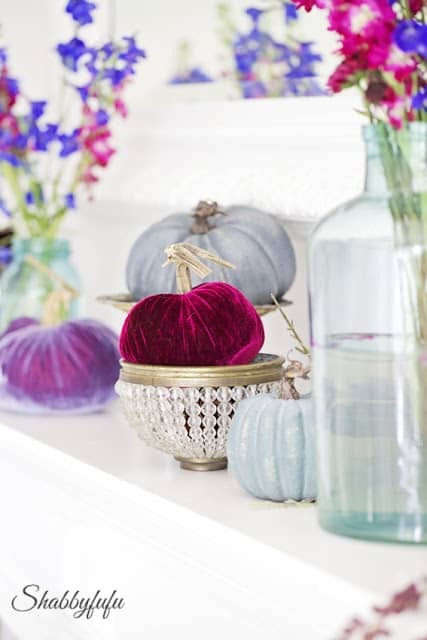 I have worked with the velvet pumpkins that have real stems for several years now, but if looking for bold color that’s not velvet there are so many chalk style paints these days available in spray cans and just go for it on the craft store variety pumpkins of your choice. You can suggest fall without using pumpkins, leaves and gourds by simple layering. 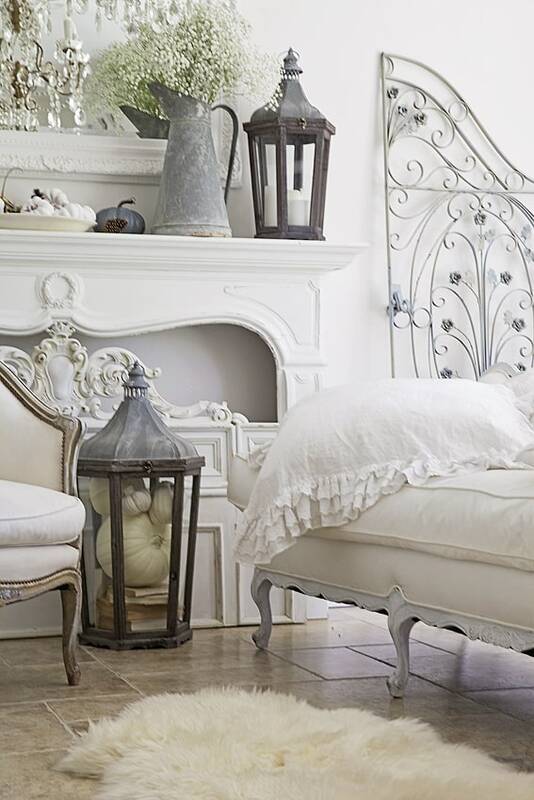 Shop your home for picture frames, yellowed books and birdcages. 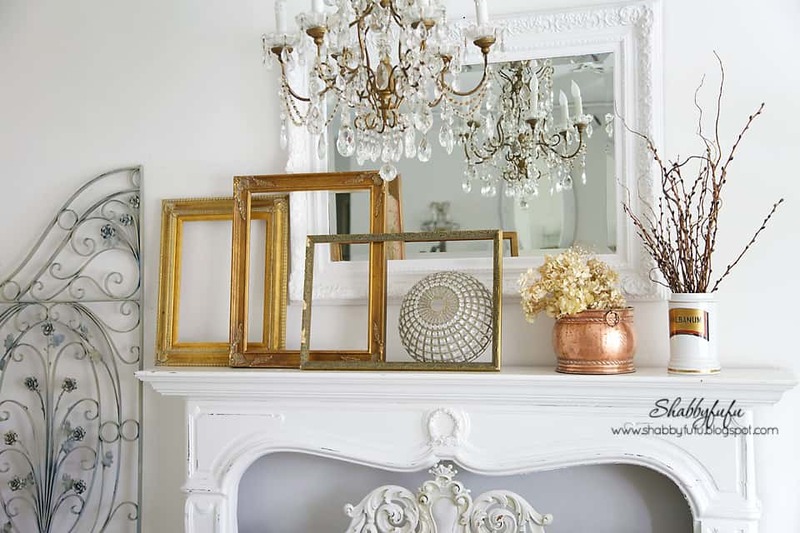 Layer several gilded picture frames for a luxe autumn look and you can often find these vintage frames at a thrift store for a song. Take several plastic pumpkins or frames that you already have and apply some gold leaf. 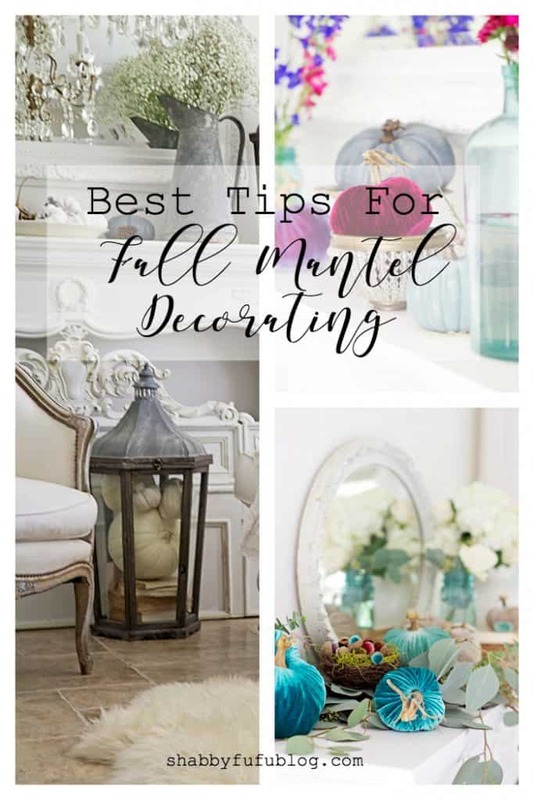 I show you how in THIS POST and then layer them and group together on your mantel. Fill in with dried flowers in a neutral vase and autumn is implied with elegant subtlety. It’s all about layering, then step back and edit your arrangement. 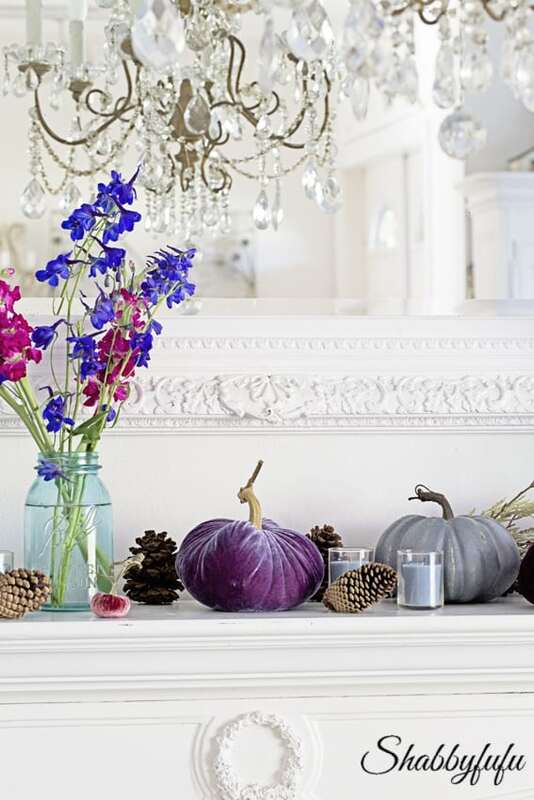 Go for that subtle punch in refined style by decorating your autumn mantel in white. I’m a huge fan of FRENCH FARMHOUSE STYLE and my seasonal theme above shows that white can be anything but boring. White baby faux pumpkins, vintage ironstone, French zinc, a few pinecones and a touch of rustic wood are all great TEXTURES to layer with in a FARMHOUSE decor. Make it sophisticated with some white flowers. You know what you like and what speaks to you, so don’t go all trendy and stay true to what you love each season. Use the color of your dreams, layer, step back and look, edit, rinse and repeat and you’ll be happy. Thanks for being here today and I’d love to have you subscribe for my posts, ebooks, printables and more! 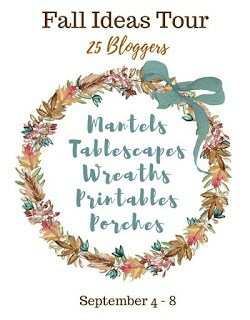 Please visit my blog friends today and all week long for the FALL IDEAS TOUR below!